How can I separate my company from the competition? The internet is becoming more comprehensive with each passing day. Almost everyone has a blog these days, so differentiating yours is a way to stand out from the competition. One cutting edge technique to make your blog unique, is to implement blog channels. Separating multiple blogs into more specific niches can help brand your roofing company, and diversify its online assets. Not only do you create more appearances on search engine results pages (SERPs), but you cater to specific niches that can each generate a core following. Most people are visual learners. Users who visit your website, and blog, are not interested in massive blocks of text without any break in between. Exclusive infographics are a way to generate unique content that will really engage users. Infographics are also a great tool to generate backlinks to your website. Authority websites will want to curate your visual content, and will link back to your website in exchange. Hubspot details how to embed code for your infographics, which will allow them to be easily shared. Infographics can be used in blog posts, as well as web pages, but are designed to give the reader a visual interpretation of the current subject. Staying on the theme of unique content, interviews are a great way to generate exclusive information on your website and blog. 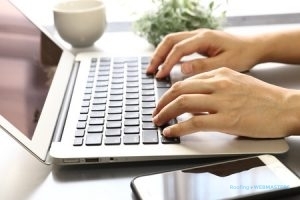 By conducting interviews with industry connections, or friends of the industry, you can help create more traffic to your roofing company website. Interviews can be presented in either text or video format. Text allows you to make the questions and answers look appealing to the viewer, while videos offer the chance to incorporate YouTube into your blog posts. In the modern marketing landscape, unique content will make your company stand out.